A little context before we talk about the author - KSD and his second book "Jump Cut". Anyone who carries a surname as revered as Devulapalli ought to carry the stamp of a literary colossus. Let's start with the grandfather, the author's namesake, written the other way around - Devulapalli Krishna Shastri. If Telugu is called the Italian of the East, some credit must go to this man who wrote the most sonorific and lilting lyrics of Telugu language. There were producers who entered films only to make movies with songs penned by Devulapalli. At one time, somewhere in the 80s, when the rate of inflation remained pegged below the Hindu rates of growth, Devulappli was rumoured to be paid anywhere from Rs.15000 to Rs.30000 per song! A sum more princely than what the Nizam of Hyderabad used to pay his Prime Minister! Devulapalli became the most loved and endearing lyricist of his time and commanded premium even after he lost his voice. Then came his son, who is a cartoonist of redoubtable fame. He became famous too as "Bujjai" and one of the cartoonists to be counted. With that kind of a legacy of writerly gene and artistic flair, it is unlikely to have a muted gene that's neither. K.S.D is one such writer who combines the flashes of his grandfather's brilliance exquisitely in his writings but probably chose a range of careers as an adman, illustrator, children's book-writer and maybe even as a standup comedian before the writing bug bit him. His first novel "Ice Boys and Bell Bottoms" was a coming of age novel, a kind of a Forrest Grump for Indian ethos with all the improbable things quirky and hilarious that happened to Krishna that got trapped in the book. Anyone who survives boyhood has enough material to write for a lifetime, so goes some writer's tip for overcoming writer's blocks. Krishna's first book as above is ample proof of this as he mixes the genre of autobiography and fiction effortlessly with lot of indefatigable humour which seems to distinguish his writerly career. It has won Krishna plaudits from writers like Anita Nair and discerning readers who don't necessarily buy and read only books recommended by Crossword bookstore owners and Landmark shortlists. I even heard one top Tollywood producer recommending it highly for ROFL effects. 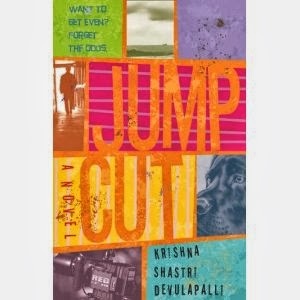 Like Puri Jagannadh of Tollywood fame, I liked the audacity of Krishna who announced in 2012 HLF in Hyderabad that his next book will be based on film industry and it is titled "Jump Cut". Puri also, for the record, announces tantalising titles with unintended consequences. So, Krishna, as he spoke at the book-launch took almost two years to write this book which includes one year spent at the editor's table of Harper Collins. "Jump Cut" is itself a snappy title which demands a google or two, maybe even consult Warner Bros. or our own Annapurna Studios to decipher what it means and why the title. Jump Cut, in film parlance, means an edit between two shots that feels abrupt or discontinuous usually intended for expressive or dramatic effect. Jean-Luc-Godard, a pioneer, is associated with "jump cut" even if he may have accidentally created it. It seems to now form a blind followership by directors of South Indian action films who love to challenge the illusions of continuous space and time within a shot that seeks to maintain continuity. It has become a motif for stylised action and dramatic shots. So, Krishna has selected a wacky title that is set in a different setting than what his first book talks about. It's about a protaganist aptly named Satyajit Ray-Raman who returns to Madras to be with his ailing father Raman, an Assistant Director to ace director Rajarajan and others in Kollywood (Tamil Film Industry). Raman passes away but not many come to the funeral which surprises Ray-Raman. His investigations lead him to a character called Rajarajan, the same guy who milked his dad without due credit and cash. He decides to fight one grand battle against Rajarajan for blatant plagiarism or violation of intellectual property rights. He weaves a surreal masala mix that reminds you of the loud eighties where the hero, his side-kick and a lady who needn't be his muse take the villain on a trip, work him into becoming more greedy and lead him to the scent of a woman and money trap that bring the house down. Three characters, Abie, Sumi and Selva are roped in by Ray in the most clandestine manner. There is also Padmini, a bold woman who turns on the hero's libido one night before her engagement to another guy. Would Ray succeed ? Will he go back to US? Will he get Padmini? How much will Sumi stoop to conquer Rajarajan? Read on to have these answered. Krishna Shastri is quite a skilful writer who can collapse a potboiler of a South film plot into some salacious prose thats rich in variety, pace and narrative. Krishna delivers a punchy, naughty, sometimes raunchy but mostly energetic output in less than three hundred pages that must score high on entertainment. Except for the first seventy pages, when he takes time to set the tone for the launch of an offensive by the protagonist of the book - Ray, I found the book mostly riveting and intensely racy with delicate turns of phrase and even over-turns of the phrase, as someone pointed out at the book launch. Krishna has the gift of an eloquent story-teller who has a voice of his own (evident even in his first book) and an incurable flair for humor that refuses to go away all through his prose. Krishna has an additional gift of an observant eye that is as precise as detailed as a camera on prowl: he compares a plate of "jantikalu" (a salty delicacy) as a collection of "infinity" signs (as in mathematics), he spots the Sun coming out of the ocean like "a swimmer jumping for a breath of air", he defines a particular movement of hands like "doing a Shahrukh". Get the point? "Jump Cut" reads like an engrossing screenplay with tens of similes, metaphors, and expletives which remain recessed in most people's memories but seldom float on paper. When you read the book, you know you are reading a new master of English prose with a dazzling voice and a narrative dipped in good humor and occasionally, very rarely, below the belt. Krishna Shastri, at the book launch, which I attended mentioned that he has plans to launch himself for a film-writing career too, which is not contextually far-fetched from the palette he is painting his life with right now - children's books, copy ads, humor columns and novellas. I am sure, South film industry will beckon him soon as humor and imagination are both in terrible short supply and KSD with his top-of-the-tree lineage is well-suited to command a price tag with a premium not unbeknownst to his family. Just in case, you think this is ending like a panegyric the way Ray drives Rajarajan into committing harakiri, wanted to remind you, dear reader, what not to expect and what isn't happening in the book? For a change, there is some Tamil in the book which could have got translated for a wee-bit better appreciation, atleast as a foot-note or in the appendix. I could not digest the proportion of Tamil words hurled at me at the cost of a few Telugu words, whatever be the arguments for elevating a classical language to that of the national language. Two, there are flashes in between chapters which justify the title "jump cut" but they remain a style but do not enhance the narrative or the characterisation. Three, there could have been more research into the issue of Intellectual Property issues of a film industry which copies unabashedly from Korean and American films and everything in between. Just a passing reference to an imaginary website pilferingpenis.com (It doesn't exist, don't try!) doesn't help the cause. Four, despite a promising start to fiction, the plot doesn't have multi-layered depth that goes beyond the three-act filmy drama. At one stage, the plot gives away when Rajarajan becomes more gullible and naive than the most idiotic and rotund villains of films like "Adavi Ramudu" and "Sivaji" and there is not much drama coming. Despite these shortfalls, "JumpCut" is a thrilling and luminous read from one of India's freshly-minted talents in writing. KSD will be a treat to read whatever he writes and if he works on the elements of drama and depth in his plots, he will be a phenomenon to watch out for.